BPS (WA) Pty Ltd are the authorised contractors for The Water Corporation being on their preferred contractors list for over 18 years. You can feel confident in the fact that you have chosen us as your trusted liquid waste removal company. We can take care of all your liquid waste removals. By using our fully equipped tankers, we are able to collect any type of liquid waste with our vacuum pump, remove it from your site and dispose of it in an efficient, environmentally controlled way. We cater for all liquid waste removal from Domestic Septic Tanks to Commercial Grease Traps, Oil Waste, Wine Waste, Fuel and Oil Separators, and effluent dams and tanks for major mining companies. 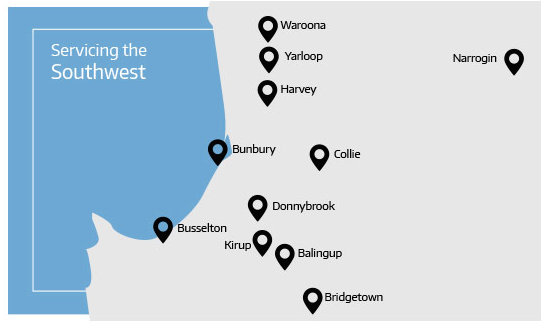 We currently travel from Bunbury to Collie, Harvey Waroona, Donnybrook, Kirup, Balingup, Busselton, Bridgetown, and Narrogin. As proud contributors to the stabilisation of the eco-system, we place a high value on collecting and recycling oil using safe, environmentally responsible methods. Waste oil removal is a convoluted process and should only be taken on by professionals who have extensive experience in the industry as well as capable knowledge about the best practise of oil waste collection and removal. Oil is a valuable resource and should be treated as such; remove and recycle your used oil with BPS systems. We supply various products to aid in the efficient waste collection at your site. A grease trap is a vital component of any commercial or industrial company where fat, oil and grease are the order of the day. Whether you are in the food and hospitality industry, or an industrial workspace, you can benefit from installing a grease trap from BPS. We provide innovative solutions whereby bacteria break down the liquid; making for a safe, hygienically clean workplace. From a sustainable living standpoint, it is necessary to separate oil and fuel from water. We supply separator tanks situated outside of your premises and generally underground, that provide an active solution to oil water separation using filtered pathways. It is best practice for these tanks to be regularly maintained and cleaned for optimal working condition. We specialise in all types of liquid waste tanks for commercial and industrial applications, from effluent systems and sullage tanks, to chemical waste and grease tanks. We supply tanks for indoor and outdoor use, as well as for underground and above ground exposure. Let the experts at BPS supply and install a liquid waste tank system that will afford you the pleasure of working in a clean, safe environment. Contact the team at BPSWA for all your waste management solutions. We are leaders in Liquid Waste Management & Septic Systems. Contact our friendly and knowledgeable staff today!